Recently, I had the pleasure of being interviewed on the most recent episode (17) of Speech Bubble, a comics-themed podcast, hosted by Aaron Broverman. 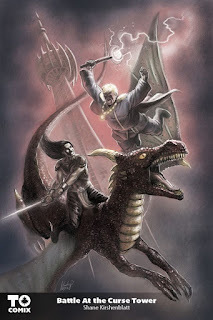 Listen (http://neversleepsnetwork.com/podcasts/speech-bubble/speech-bubble-shane-kirshenblatt) as we talk about my career as an artist, adventures (and pitfalls) as a toy store co-owner and lifelong collector/enthusiast and a little about upcoming projects! Had a lot of fun on this show and once you listen to this episode, you'll totally want to check out all the others which focus on Toronto's comic book industry and creator community! 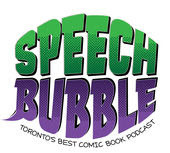 You can subscribe to Speechbubble through iTunes for all the latest episodes (free) and listen on your favourite device anytime! I am pleased to announce that the Toronto Comics Anthology Vol.3 has been successfully funded on Kickstarter (124%)! Honoured to be a part of this, which features all new stories by many top-notch Toronto creators, and an amazing cover by Adam Gorham! This book also features the first ever collaboration by my wife, Sari Kirshenblatt and myself (an autobiographical fun short called, Taste of the Neighbourhood; she wrote it, I drew it). 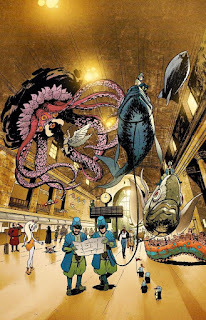 The book is slated to launch at TCAF (Toronto Comic Arts Festival, Sat May 14, 2016) and though I won't be there in person, many of the creators will be on-hand to sign copies purchased there. Excited to see this come to fruition! It was truly a thrill when I received the confirmation (from Hogtown Horror Editor Nelson Da Rocha) earlier this year that my story submission for the first volume had been accepted. Horror has always been one of my favourite genres to work in and as a longtime fan of the old EC Comics (Tales From The Crypt, Haunt Of Fear, etc) series, I've jumped at any chance to participate in such projects. I was therefore humbled to not only have my story accepted into this first collection of Canada-centric tales, but also honoured to be offered the opportunity opportunity to do the title designs and book cover! Stay tuned for more details about Hogtown Horror, which will be launching in the fall. Hogtown Horror Title Design by Shane Kirshenblatt.